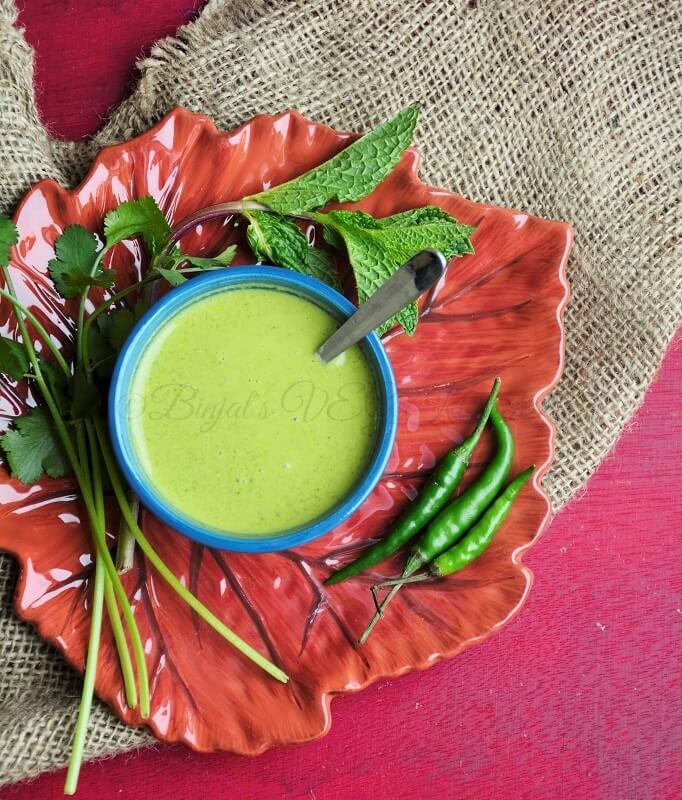 Coriander Mint Chutney is an unusual combination of coriander, mint and curd. Coriander Mint Chutney very tasty, flavorful and lip-smacking chutney. This Coriander Mint Chutney is a perfectly goes with any snack as a dip, spread or chutney. Coriander Leaves are particularly rich in vitamin A, vitamin C and vitamin K, with moderate content of dietary minerals. Mint is packed with antioxidants and phytonurients that can work wonders for your stomach. The menthol present in Mint helps the enzymes necessary for digestion. They relax the smooth muscles of the stomach, reducing the chances of indigestion and spasms. They can also act on these muscles to activate them and help work more efficiently to carry out digestion. 1. Clean, and then wash coriander and mint leaves. 2. Add coriander, mint leaves and green chilies in a blender. 3. Then add salt, cumin seeds, lemon juice and blend it to make a smooth paste, use 2-3 tbsp water or as required. 4. Whisk the yogurt/dahi in a bowl till smooth. 5. Add prepared paste in the whisked yogurt, and then mix well. 6. Coriander Mint Chutney is ready to serve, with Idli, Dosa or any snack. • You can adjust a spice level by green chili quantity. 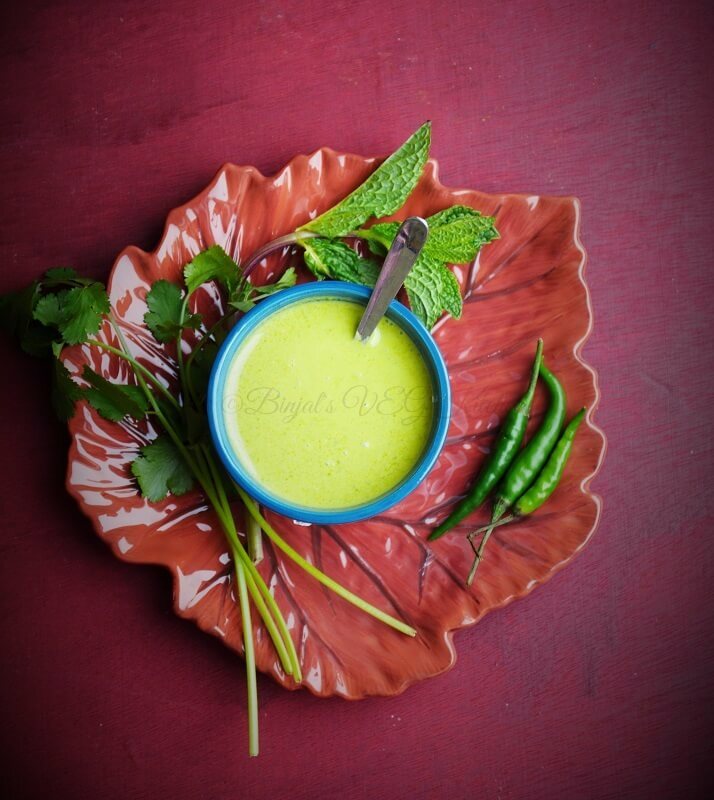 Coriander Mint Chutney is an unusual combination of coriander, mint and curd. Coriander Mint Chutney very tasty, flavorful and lip-smacking chutney. This Coriander Mint Chutney is a perfectly goes with any snack as a dip, spread or chutney. Coriander Leaves are particularly rich in vitamin A, vitamin C and vitamin K, with moderate content of dietary minerals. Clean, and then wash coriander and mint leaves. Add coriander, mint leaves and green chilies in a blender. Then add salt, cumin seeds, lemon juice and blend it to make a smooth paste, use 2-3 tbsp water or as required. Whisk the yogurt/dahi in a bowl till smooth. Add prepared paste in the whisked yogurt, and then mix well. Coriander Mint Chutney is ready to serve, with Idli, Dosa or any snack.